Get picked up from your hotel in New Orleans for a 2-hour boat tour in Honey Island Swamp, a wildlife preserve that is one of the last protected wetlands in Louisiana. 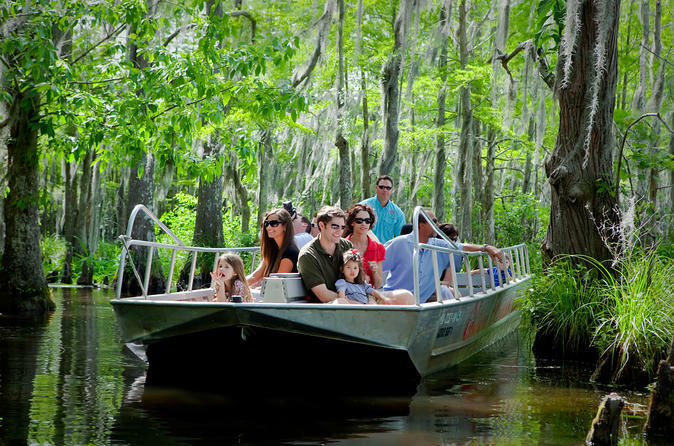 Visit a Cajun village only accessible by boat; learn about the animals and plants in the lush swamps; and get close to wildlife with an expert local guide. After pickup from your hotel in New Orleans, it's a short drive across Lake Pontchartrain to Honey Island Swamp, a wildlife preserve that is one of the last protected wetlands in Louisiana. Your guide welcomes you aboard a custom-made 22-passenger flat-bottom boat. The smaller sized, quiet boat can fit through narrow passages in the swamp foliage so that you see more and get closer to wildlife. It’s the ideal way to take in the lush environment of Cajun country. As your guide explains the history of Louisiana’s wetlands and swamp ecosystem, be on the lookout for resident wildlife including alligators, raccoons, owls, wild boar, nutria, snakes, turtles, black bears, bald eagles and many other bird species. Get a close look at some wild gators as your guide shares facts about the toothy beasts, who can weigh up to 1,000 pounds (453 kg). Their ancestors once roamed the earth with the dinosaurs and scientists estimate that they have existed for more than 150 million years. Glide safely through the fertile swamplands, learning about Cajun culture and how local people have utilized the swamp for food, homes, and medicine from your guide. You even see an authentic Cajun village that is only accessible by boat. Gain an understanding of why the wetlands are slowly disappearing and about the efforts being made to preserve Louisiana's natural treasures. After a fascinating 2-hour boat tour on Honey Island Swamp, your guide returns you to shore. You can either take the coach back to your New Orleans hotel or make your own way to your next destination, depending on the option you have chosen when booking.